Celebrate February With Groundhug Day! By far, this is the perfect story for February. Not only are you getting Valentine’s Day but also Groundhog Day! Both holidays are really seen together, but this time all of the animals want Groundhog to celebrate Valentine’s Day with them. Only what if he sees his shadow? Then he won’t be awake for the party! Groundhug Day is a delightful romp about how to help a good friend overcome his fears. 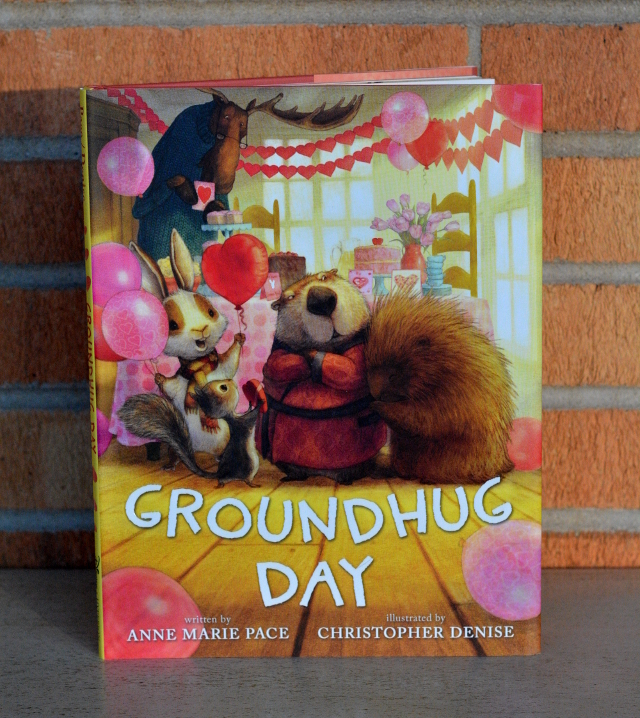 This tale by Anne Marie Pace is a lighthearted way to introduce Groundhog Day to your children. The holiday certainly comes across as silly. I remember not understanding the concept when I was younger of why the groundhog would spend six more weeks sleeping. Instead, you get all of the animals trying to figure out why Groundhog hates his shadow. He is afraid of shadows! A perfect opportunity for you to combat any fears your listeners may have. Plus there are a lot of cute ideas of how to make Groundhog more comfortable that you can do at home. 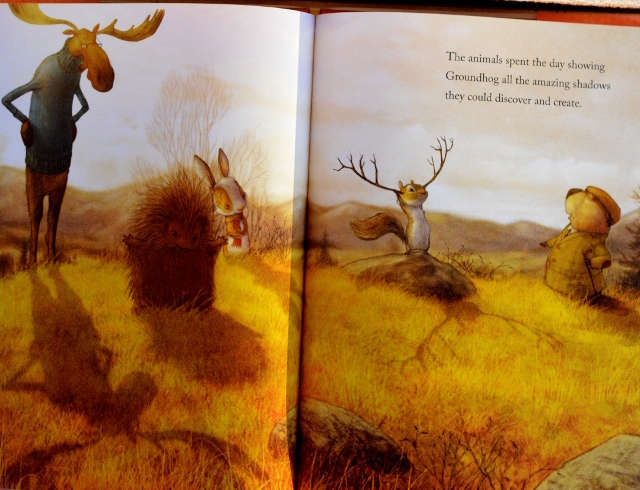 Shadow puppets and silhouettes are some of the ways they help Groundhog feel more comfortable. The moral of the story is that you need to understand why your friends are upset and scared. You may want to help them, but first you need to know why they feel that way. You cannot stop a Groundhog from seeing his shadow, but you can teach him that shadows are a lot of fun. Groundhug Day features some adorable illustrations with cute yet realistic animals. Christopher Denise has a flair for making all of the animals accurate and friendly. I especially enjoy that Moose wears glasses that hang making his nose look super long. 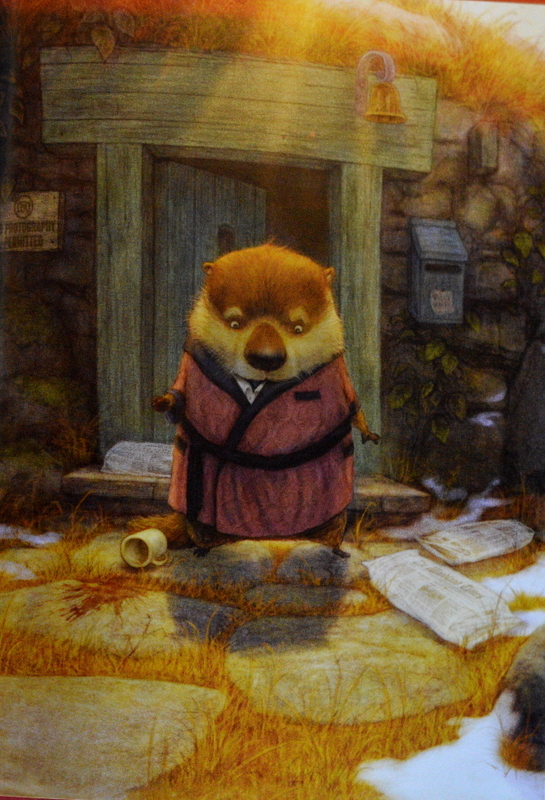 The outfits that Groundhog wears are especially dapper. He has a tweed coat as well as a fancy dressing gown. This is certainly one book that I am looking forward to giving to my niece and nephew. I hope that they will have fun hearing it and trying out all the ways to play with shadows. I’ll need to warn their parents they need to have pencils, papers and fingers at the ready for a great show! As always you can find Groundhug Day and many more books from Disney Hyperion! 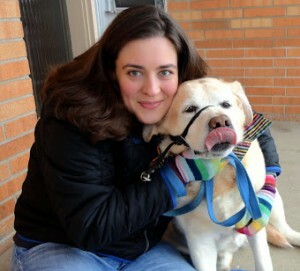 We hope to bring share more of their stories with you because they are too cute to pass up!